A $50,000 reward has been offered for any tip leading to an arrest in the fatal shooting of a 7-year-old girl who was killed in Houston when a driver pulled alongside her family's car and fired into it. Investigators continued the search Wednesday for the driver of the red, four-door pickup captured on surveillance video shortly before the shooting Sunday morning in the eastern outskirts of Houston. 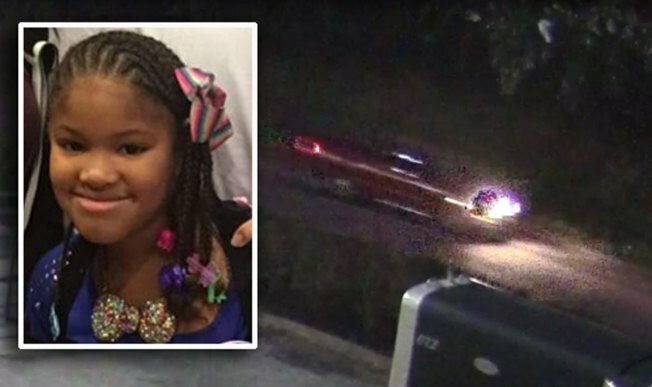 Jazmine Barnes died at the scene and her mother, LaPorsha Washington, suffered a gunshot wound to the arm. Jazmine's three sisters were also in the car and one of them was hurt by shattered glass. Sheriff Ed Gonzalez has declined to speculate on what prompted the shooting, describing it as "totally unprovoked." The sheriff's office has asked people who live nearby to review their surveillance videos. Merritt said Wednesday that he understands his and King's high profiles as activists means they will reach a lot of people with their appeal. Merritt said they will pass on any leads to the sheriff's department. A distraught Washington told KTRK-TV from her hospital bed that the gunman sped up after firing into her car, only to pull in front and slow down before firing again. "He intentionally killed my child for no reason," she said. "He didn't even know her, he didn't know who she was." The Sheldon Independent School District said in a statement that Jazmine was a second-grader at Monahan Elementary in Houston. The school district said additional counselors will be at the elementary when students return on Tuesday. The district asked parents to tell their children about Jazmine's death.